Platelet-rich plasma or PRP is such a substance that is used to promote the growth of hair after injecting it into the scalp. The plasma is such a component in the blood that is responsible for blood clotting and a protein that helps in cell growth. The plasma is obtained by centrifuging blood and then separating the plasma content from it. So the idea is all about injecting a PRP concentrated solution into the damaged tissues that helps in stimulating the growth factor of the body. It is said that the PRP is responsible for stimulating the healing and growth. This treatment procedure has been a proven one and it gives the best results. Now PRP technique is used for various purposes and it has numerous other applications like hair loss, tendon injuries, acute injuries, postsurgical repair, and osteoarthritis. PRP technique for hair loss is a highly simple and straightforward technique since it is a very safe procedure and do not involve any major pain or bruising. The procedure involves a very short recovery time. Since the procedure is performed on an out-patient basis, the patients are able to return home on the same day of undergoing the procedure. In fact, they can resume regular activities on the same day even though there may be some restrictions posed by performing vigorous activities. Another most important aspect of undergoing the procedure is that it is a cost-effective procedure and may be affordable by most of the people. The final best part of the procedure is that it provides absolutely best results that appear to be extremely natural. 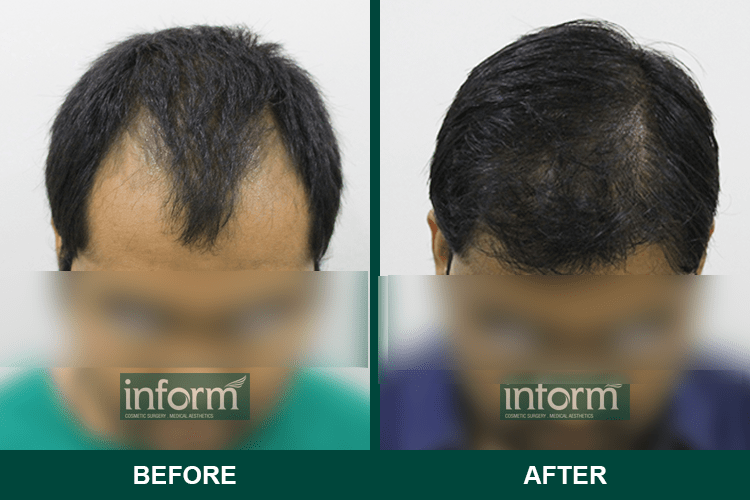 PRP is a non-invasive and safe hair restoring procedure that is a completely safe procedure for treating hair loss or hair thinning. In this procedure, blood is used to stimulate the growth of the natural hair follicles. The procedure begins with collecting blood from the patient’s body and then centrifuging the blood so that the enriched cells (that is the platelets) remains. This system helps in eliminating the granulocytes which may impair the tissue regeneration and wound healing. After centrifuging, the concentrated PRP solution is achieved which is near about three times more concentrated than the normal blood value. The patient is then administered with local anesthesia at the scalp so that they experience no pain. The solution is then taken into a thin needle and finally injected into the scalp. After completing the injection, the patient’s hair is then washed and the patients are then ready to return home immediately. The growth factors in the solution stimulate the growth of the hair follicles. This procedure is effective for both men and women as well. According to the dermatologists and other researchers, our blood plasma (PRP) actually contains an active growth factor that is responsible for promoting the hair growth thus helping to restore the confidence and self-esteem. Human blood basically contains some stem cell that is autologous blood products and contains some essential and specific growth factors that help in assisting the tissue regeneration and healing. The procedure has been found equally effective on the skin also as it can effectively help in skin healing. It is said that the PRP content of the platelets can theoretically promote the growth of the hair follicles by stimulating the stem cells or any other cells in the microenvironment of the hair follicles. These special platelet cells help in promoting the degree of healing and accelerating the healing process and regeneration procedure. Therefore the most important aim of using a PRP procedure is restoring an inactive and newly implanted hair follicles into an active growth phase. The platelets also have other structures like glycogen, lysosomes which are the key ingredients in healing and repairing process. Since the PRP procedure is least invasive , it does not involve any major complications. Any chances of side effects that are caused after undergoing a PRP technique is hardly seen. 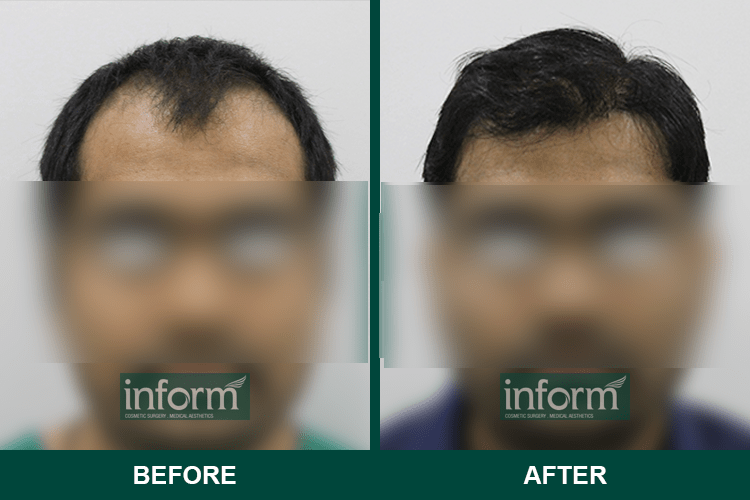 The patients are able to return back to normal activities immediately after undergoing the procedure. Most of the patients are able to drive home on its own. However, for cases of any compilations like excessive swelling, pain, the candidates must necessarily undergo a check-up from their respective cosmetic surgeon. The results acquired after undergoing a PRP procedure may vary from person to person. Therefore, there is no such guarantee that anyone undergoing the procedure would be successful. The success of the procedure can be estimated by performing some of the preliminary studies. 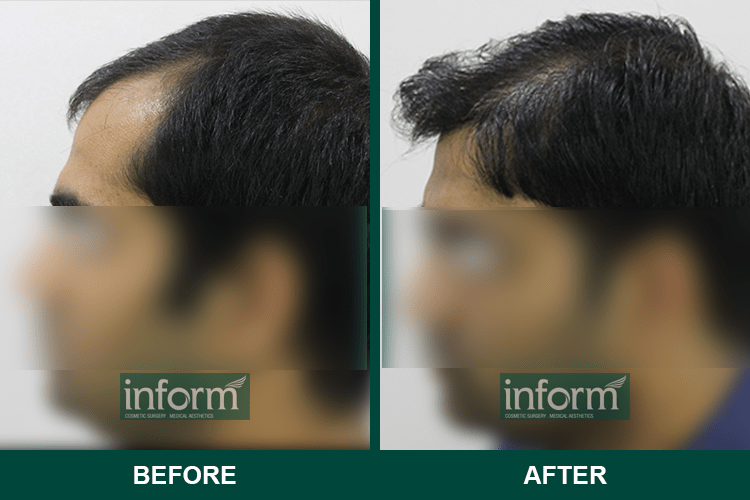 Some hair restoration surgeons may apply the PRP procedure to the scalp for every three to four months. However, any PRP treatment will not be able to provide satisfactory results by undergoing only a single procedure. The patients must need to undergo a number of procedures in order to achieve the best results. Additionally, not all the people are eligible for undergoing the procedure. Patients who are highly addicted to smoking, drugs, and alcohol are not at all recommended to undergo the procedure. Also, patients with other medical diagnosis of platelet dysfunction syndromes, chronic liver disease, another skin disease, etc. must not undergo a PRP treatment procedure. Hyderabad- the city of pearls has now become one of the leading cities in India. The city has undergone a complete all-round development. Various sectors started flourishing in the city and cosmetic surgery is one among them. Recently with the increase in demand of undergoing cosmetic surgery procedure among people gave rise to innumerable clinics and hospitals. Now, the real trouble of the people is finding out the best surgeon among all present in the city. So if anyone is finding the best and trustworthy surgeon then Inform Clinic is the one. The clinic is at the Jubilee hills on the 3rd floor, park view that is immediate to the CVR health. Dr. Dushyant Kalva is the chief cosmetic surgeon that has over 15 years of experience in the field of cosmetic surgery and hair transplant. He is an excellent surgeon who is dedicated to providing the best quality services to enhance the quality of life of the patients and transform the body to improve the best features. The clinic specialises in almost any cosmetic surgery procedure like aesthetic dermatology and reconstructive surgery. Therefore cherry picking Inform is probably the best option for most of the patients. After consulting with the surgeon and deciding to undergo the PRP procedure, the surgeons usually provides with some pre-op instructions which the patients must follow minutely to avoid any type of complications. The instructions include avoiding certain corticosteroid medications for 2 to 3 weeks prior to the procedure. Patients are also instructed to stop taking non-steroidal anti-inflammatory drugs such as ibuprofen or aspirin for at least a week prior to the procedure. Some anticoagulation medications must also be avoided at least 5 days before undergoing the procedure. Additionally, the patients are also advised to drink plenty of fluid to avoid dehydration. On the day of undergoing the procedure, the candidates are asked to reach the office as early as possible. Then the patients are administered with local anesthesia on the scalp so that they experience no pain or discomfort while performing the procedure. The injections are finally injected into the scalp and the patients do not experience any pain or discomfort during the procedure. However, at the end of the procedure, the surgeons usually wash the scalp and they can return home immediately after following the procedure. The patients do not feel any pain or discomfort at the injection site hence it involves no downtime or recovery. But undergoing a single procedure will not provide any good result, so it is very important for the candidates to undergo a series of procedures at a certain interval of time. The results will not be visible immediately after undergoing the procedure, but most of the results are observed after three to six weeks. No, PRP injections are not really painful for people who can tolerate the injections well. However, some people may, however, experience some soreness after the injection session as a result of PRP induced an inflammatory response. It is normal to experience little swelling and soreness during first two days of undergoing the procedure. Fortunately, it is self-resolving. How quickly do these injections take time to work? Most of the patients are able to see some improvements within 2-6 weeks of undergoing the procedure. But to achieve a final desirable result, undergoing 5-6 sessions is important. Are these PRP injection completely safe? Yes, the PRP Injections are completely safe because it does not use any foreign materials for injecting into the body. Rather it uses the body’s own platelets. There is hardly any risk involved in the procedure unless some patients may find some infections at the injection site on the scalp. But this is very rare. So, PRP technique has now been recognized as one of the best, effective procedure.